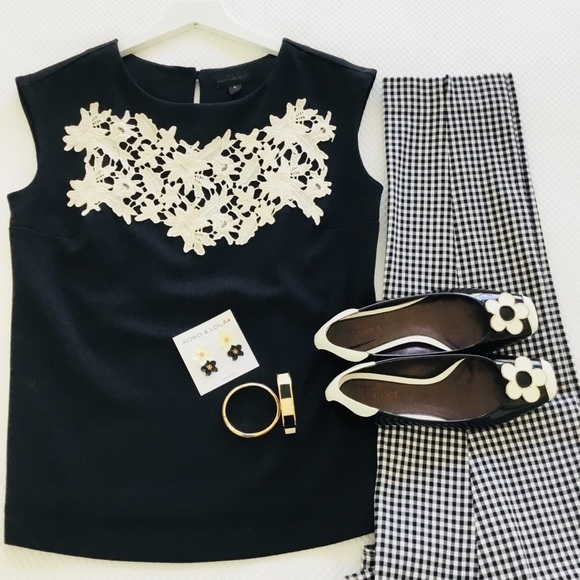 A FASHION POST: The Black And White Of It ALL! 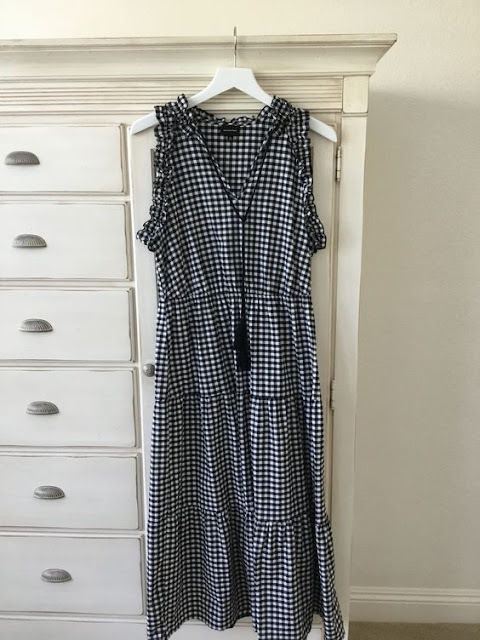 I have been purging my closet again, and listing my pieces on Poshmark. 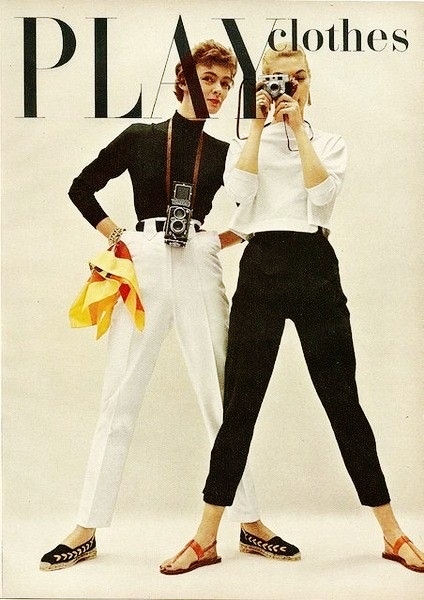 When I started looking at my wardrobe I realized once again how much black and white I wear. It seems to be the base of my wardrobe with plenty of bright colors as accents. My method in my wardrobe is also my method in my home decorating. Funny how that seems to work! I think when you are being true to who you are and what you love it is a natural evolution that occurs. I know it has evolved for me over the years and I am very comfortable with my wardrobe and my home. One of the things that I have discovered that I truly enjoy is putting outfits together and when I style my pieces for my Poshmark closet, I seem to get into the ZONE and love it. Yesterday was a poshing day for me and I went through my closet once again and was honest with myself on what I am wearing and enjoying and some of the pieces that no longer fit me the same that they once did. 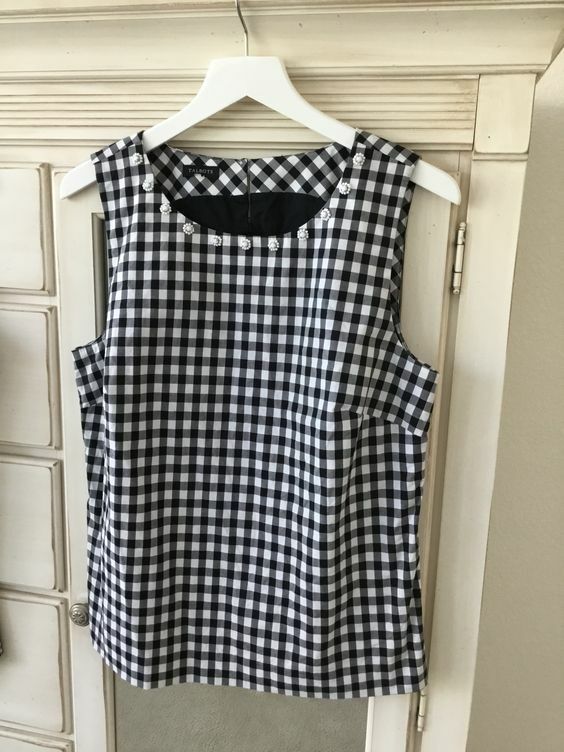 Top Available in my poshmark closet, HERE! Our body size and shapes change as we get a little older and I am finding that to be the case with me. Sometimes I have to be brutally honest, but in the end it feels good to eliminate things out of my closet that just aren't working. 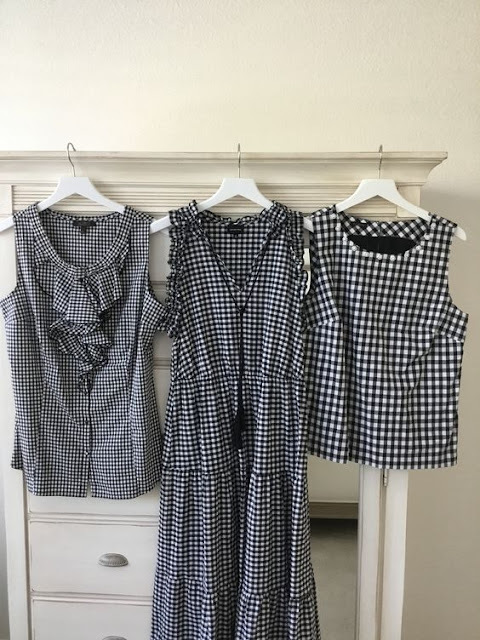 I will say I don't use the, if you did not wear in a year method, because I have some things in my closet the are what I consider specialty outfits, you know the kind you wear for a special event and it is classic so it stays in my closet. My method is more of what fits me and what I feel good in. I will say at this point that having a poshmark closet has made it so much easier to let things go. My loss is someone's gain and I also get a little extra money to purchase something else I might want. The one print I absolutely love in black and white, besides stripes is gingham. I know it's a huge trend this year, but to be honest for me it's just an old friend and true classic. I am just happy to be able to find so many offerings this year. 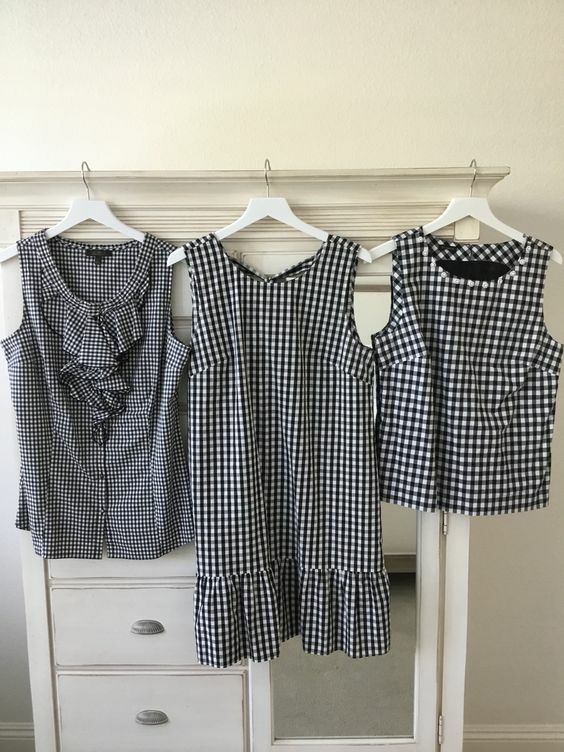 All of these pieces are easy breezy pieces to wear and I love them. When other's leave the gingham trend behind it will still be alive and well in my closet. 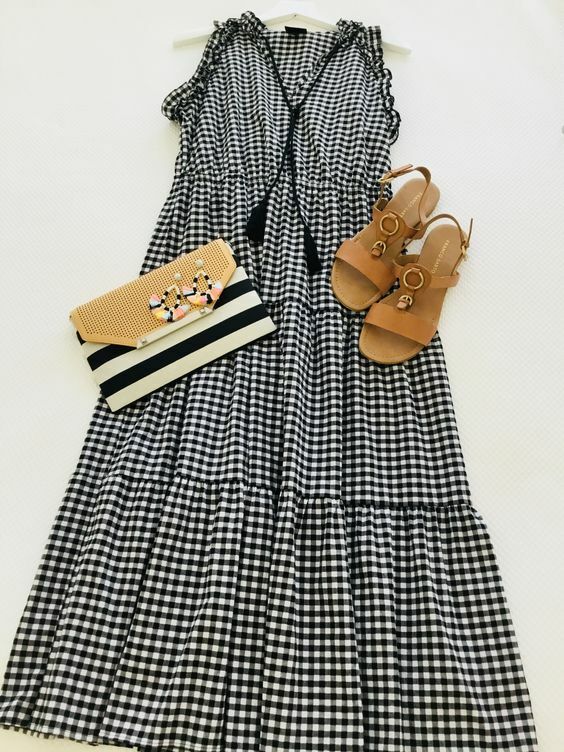 I love these sandals and when I wear them I keep them as the only gingham in my outfit. 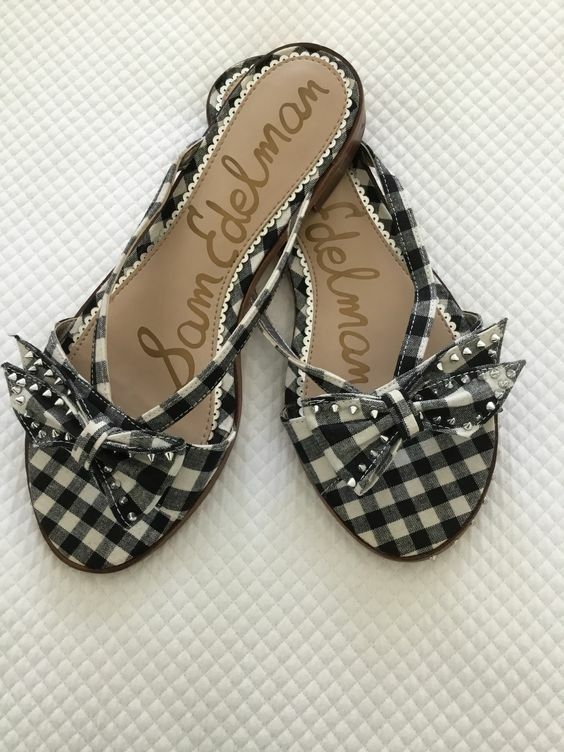 I know people are mixing their gingham in one outfit, but for me I am more comfortable with just my shoes being the star gingham piece. These are cute with a light wash slim ankle jean and just a white t-shirt and a cute bangle bracelet. Simple and classic. Equally as cute with bright colored pants and simple t-shirt. Would you believe I found this at Target!? I know right!! Actually my DIL showed it to me and I fell in love so of course I had to get it. The earrings are so fun and they are also out of my box, but look at the black and white stripes!! I had to get them. 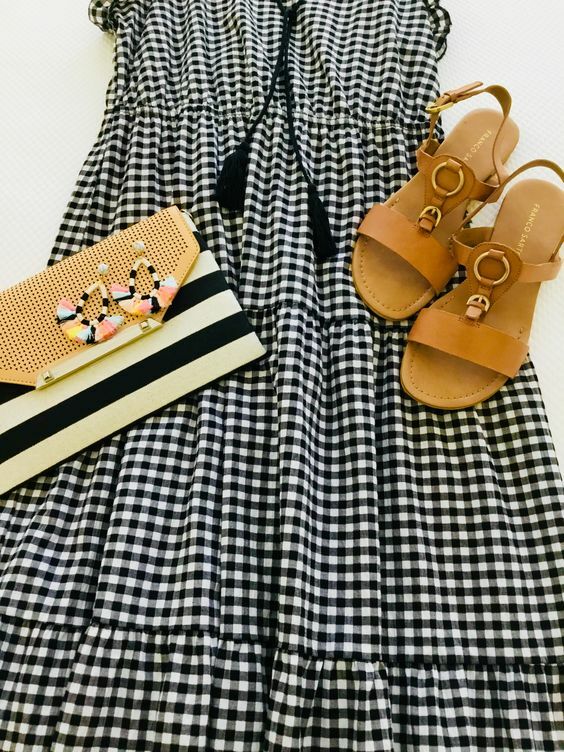 I put the striped clutch to echo the earrings and the natural colored leather sandals are another way that pulls the purse into the outfit. I would also pair this with my hot pink slides. 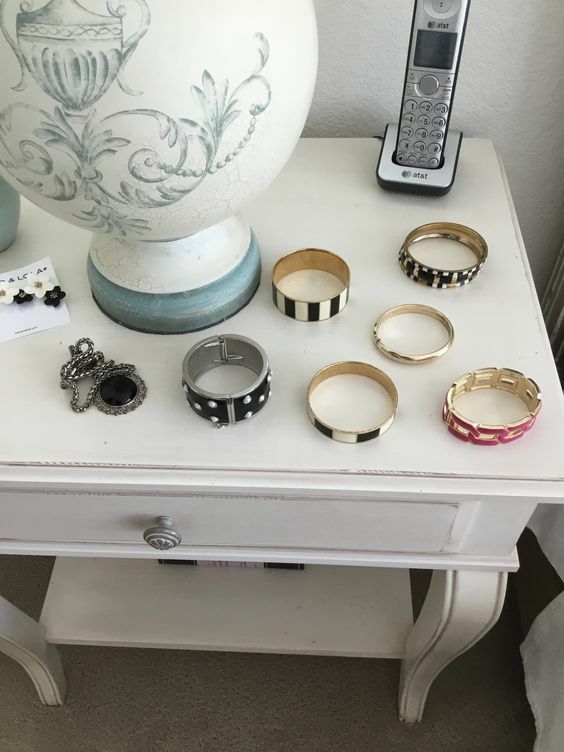 I love bright accents with black and white, but will usually keep it to a minimum like shoes, bracelet, or a purse but not all three at once. I have a theory for my dressing and styling outfits, decide which piece is the star and everything else is a co star. J. Crew dress sold out, sorry! 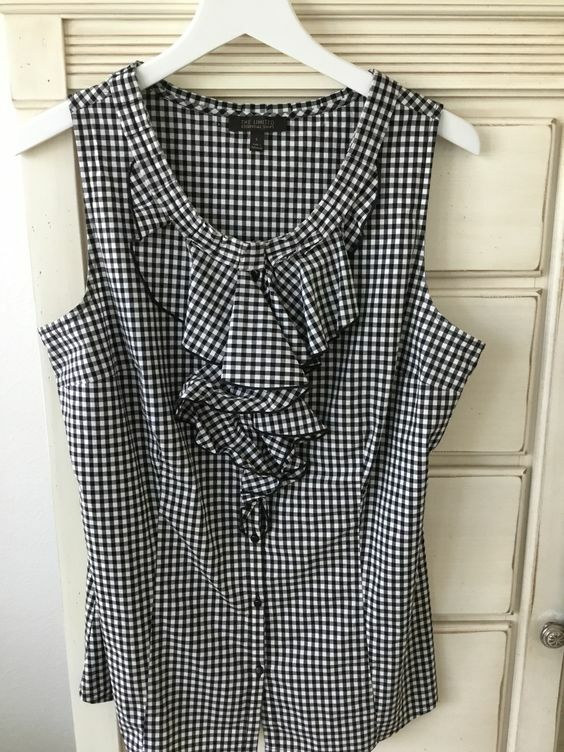 Top from Talbots, no longer available. 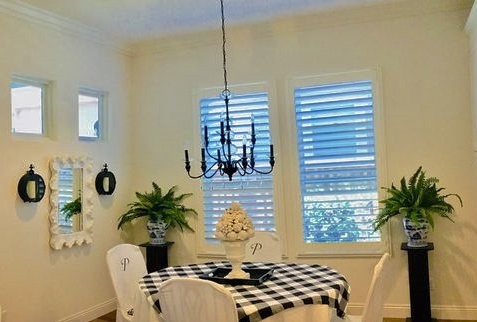 I love the freshness of black and white with a pretty Kelly green. 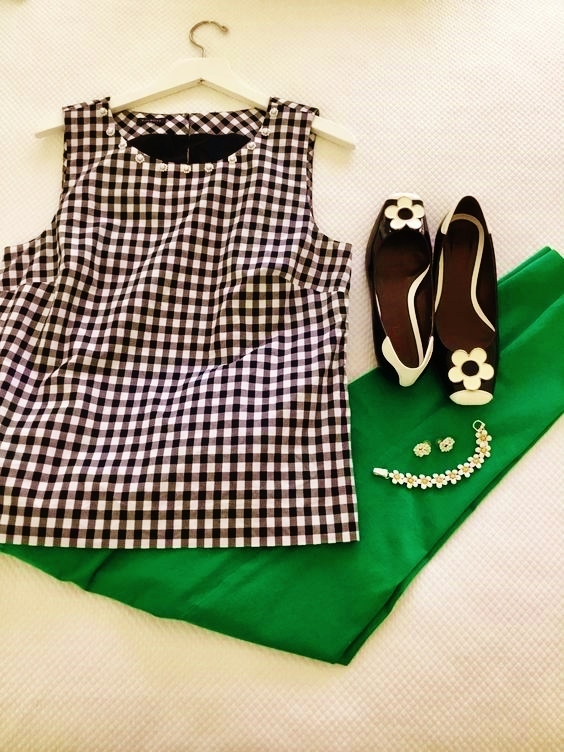 Out comes my preppy side with daisies on my toes, ears and wrist!! It's a bit contrived, but I love it with this particular top. I would also wear it with blush pink pants, or cobalt blue as well. I am not a much of a ruffle gal but this top was classic and subtle enough I went for it and I am so glad I did, it's just the right amount for me. The top fits close to the body so it's very figure flattering. We girls always appreciate that. BLACK AND WHITE ARE ALIVE AND WELL IN OUR HOME! !